JERUSALEM -- For many years, a collection of paintings by Gustav Klimt, some of them stolen by Nazis, languished in a quiet apartment on Vienna's Strudlhofgasse, hidden away from the growing obsession with the early modernist who painted "The Kiss." The paintings had been collected by Gustav Ucicky, a Nazi propaganda filmmaker who was one of the illegitimate sons of Klimt, and they were now held by his aging widow Ursula. On a rainy day in Vienna, I knocked on her door, to ask her what many art experts now wondered: What would she do with her priceless stolen paintings, in the wake of the rising furor over Nazi looted art? Ursula Ucicky sent me away. Now, as George Clooney prepares to explore Nazi art theft in his upcoming film, The Monuments Men, a few answers about these hidden-away Klimt paintings are finally coming to light. A few days ago, Vienna's Der Standard newspaper reported that one of the missing paintings, Klimt's spectacular "Water Snakes II," a painting of sensually sinuous women floating in the sea, had been recently sold for $112 million, to the daughter of a Qatari emir. How was this possible, given the fact that this famous painting, last photographed hanging on Ursula Ucicky's wall, was of a stature that was considered patrimony, and would have required a special exit visa? Since pressure to return art stolen by Nazis began in the 1990s, Austrian museums have returned a dozen stolen Klimt masterpieces. The "Water Snakes II" painting was stolen as its owner, Jenny Steiner, a Hungarian cousin of Joseph Pulitzer, fled to Portugal. Joseph Pulitzer's son recommended her for a visa to the United States, and she escaped. Her painting had been slated for auction at the Vienna's famed Dorotheum auction house. But it was withdrawn at the order of former Hitler Youth leader Baldur von Schirach, now the Reich governor of Vienna, who handed it over to Gustav Ucicky, according to Austrian experts on Nazi looted art. Thomas Trenkler, an infatigable Vienna reporter on Austrian stolen art, reported that the proceeds of $112 million sale were shared by Ursula Ucicky and the heirs of Jenny Steiner. Trenkler wrote that Ucicky used her share of the sale proceeds to begin a new Klimt Foundation to honor the legacy of Klimt. Sotheby's, who Trenkler identified as the broker of the sale, had no immediate comment. The new Klimt Foundation would say only that "Water Snakes II" is not in its collection, and is no longer listed in the Art Loss Registry of outstanding stolen art. 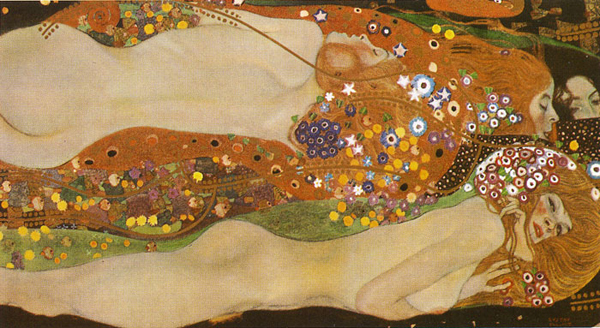 The Foundation said that only one of its four Klimt paintings and 10 drawings has a disputed provenance. That is the portrait of Gertrude Loew, the daughter of an intellectual Vienna physician who was a friend of Klimt. The ethereal portrait is one of the finest examples of the series of paintings now known as "Klimt's Women." When it was exhibited in 1903, critics called it "the most sweet-scented poetry the palette is able to create," an image of "the still half-closed bud of a girl's chaste soul." It is claimed by her son, Dr. Anthony Felsovanyi, 98, of Menlo Park. In an interview for my book, The Lady in Gold, the Extraordinary Tale of Gustav Klimt's Masterpiece, Portrait of Adele Bloch-Bauer, Felsovanyi told me that when Adolf Hitler marched into Vienna in 1938, his family fled, and his mother left some of their possessions with friends for safekeeping. A baroness friend apparently gave the Klimt portrait to her boyfriend in the Gestapo. The new Klimt Foundation says it will also work to spotlight the rather dubious legacy of Ursula Ucicky's late husband: Gustav Ucicky, a son of Klimt with a Czech laundress named Maria Ucicka. Ucicky directed one of Marlene Dietrich's early films, Cafe Elektric. He had to be prevented from firing the assertive actress, who portrayed the kind of sultry, smoldering demi-monde that would someday win her fame in The Blue Angel. After Hitler came to power in 1933, Ucicky became a director of Nazi propaganda films, including one, Heimkehr, which Nobel-winning writer Elfriede Jelinek has called the "worst Nazi propaganda film." A young Austrian director, Billy Wilder, was among those who shunned Ucicky, leaving a Berlin party when Ucicky arrived, saying, "the air smells bad with a Nazi in the room." Wilder left for Hollywood, to direct classics like Some Like it Hot, Sunset Boulevard, Stalag 17, and Witness for the Prosecution.